The roles that women play in America have changed dramatically in the last 50 years, and that has had a tremendous impact on our country. The stories of several women who have been at the forefront of those changes will be highlighted in a documentary, Makers: the Women Who Make America, airing on Tuesday, February 26th at 8 p.m. on witf TV. 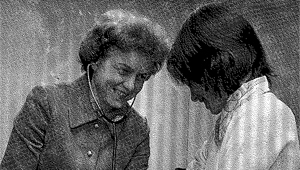 Dr. Marion Johnston who became a doctor in the 1950s was recognized by witf as a local MAKER. In conjunction with the documentary, witf highlighted the stories of two Midstate Makers, longtime prison volunteer Grace Marie Hamilton and Dress for Success founder Ruth Koup, on its Radio Smart Talk show. You can hear more on a podcast, or tune into the station at 7 p.m. for a rebroadcast just before MAKERS airs.